I fell in love with this month’s box! I loved every single item, they really nailed it. Even the box design was gorgeous. I think they should change up the boxes more often, gives a collectable feel. if you haven’t yet tried these plastic, stretchy bobbles, then where have you been?! They help to reduce hair breaking, or rubbing against the usual bobble material which causes friction and snapping. Usually, I use Primark’s 12 for £1.00. Which do the job just fine, but eventually they stretch out of shape or snap. For the price, I don’t mind this, but Popanga definately seem sturdier and of a higher quality material. This sample is a little big for my fine hair, but I will be ordering more from their colourful range in the smaller size! At this time of year, it’s inevitable that with my pale skin, I’m going to get burnt. Don’t get me wrong, I use suncream, but somehow the sun finds a way! 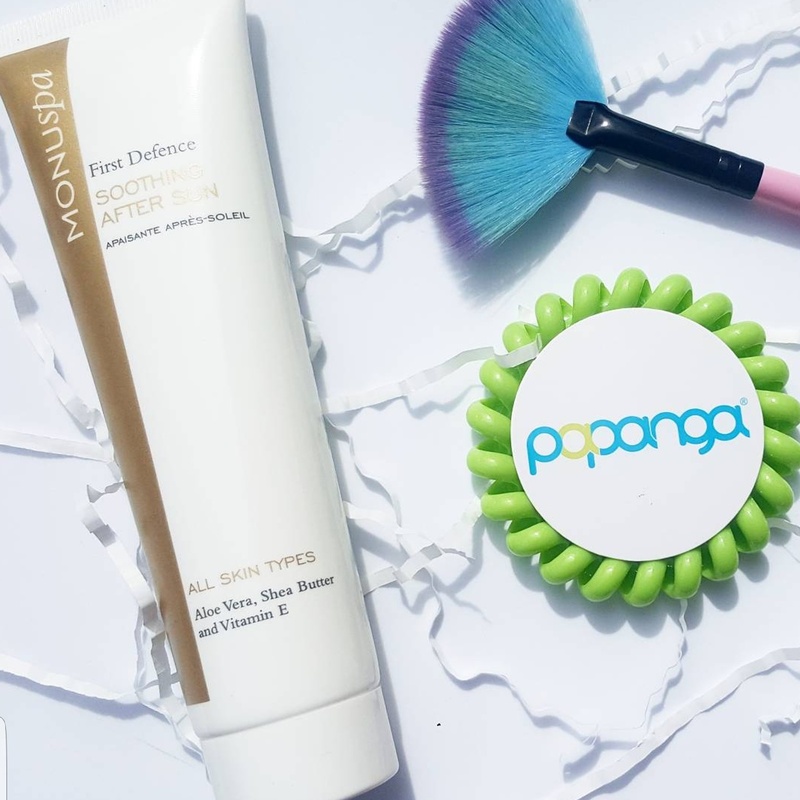 So a moisturising aftersun from MonuSpa is a handy bottle to have lying around – just in case! It’s suitable for all skin types too. I was pleased when I saw that they had included a powder. The Banana setting powder appeared at first to be too dark for my pale skin. However, the yellow hue actually helped to disguise my redness and it blended in well. It didn’t set in patches and was easily applied with the spectrum fan brush! Finally, I was one of the lucky few who got a Shills sheet mask! 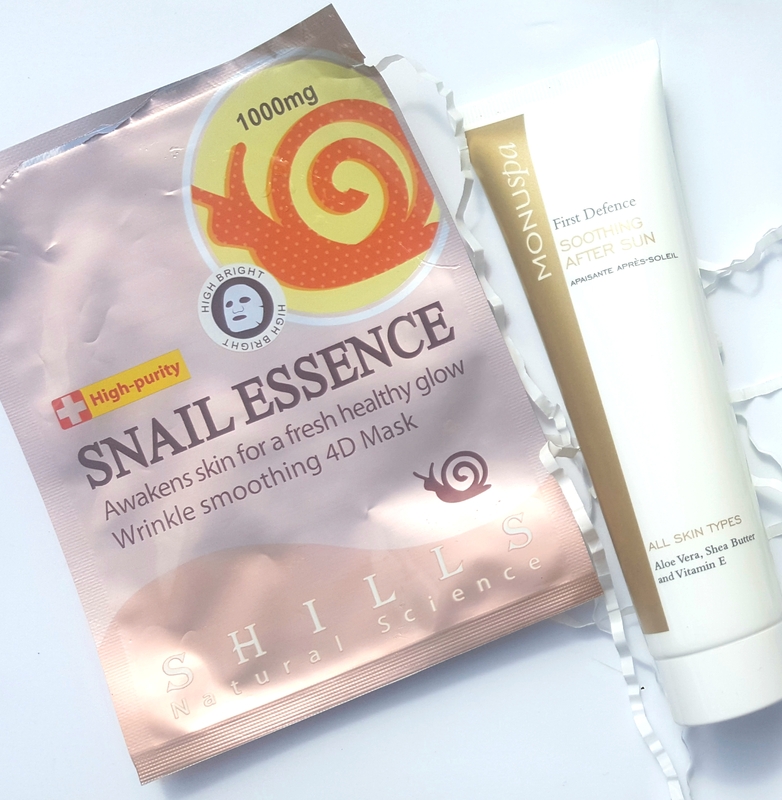 This one included essence of snail… apparently designed to awaken and freshen skin, helping to combat wrinkles. I absolutely loved this! My skin felt so smooth after and it was so cooling to wear. It fitted well to my face shape and will definitely be repurchasing this. 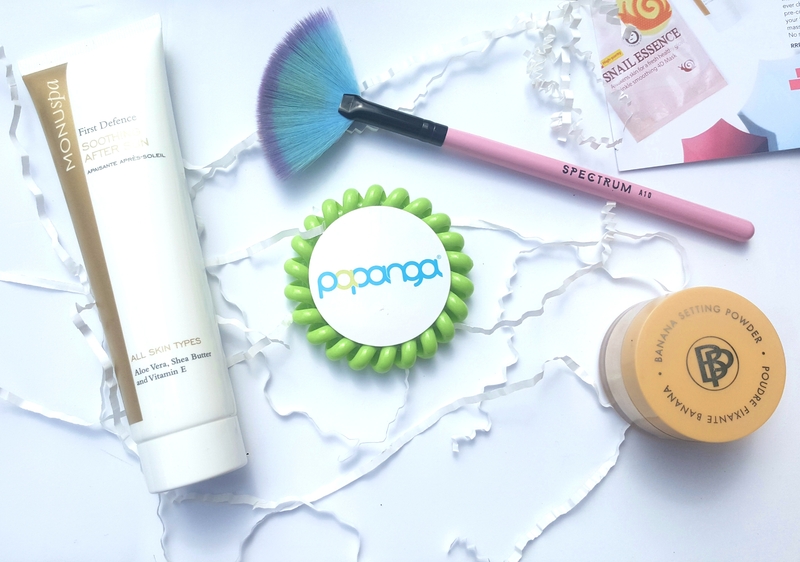 Sign up today to receive your July box for only £5.00! (+PP) subscribe here.